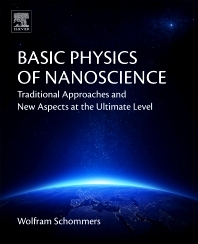 Basic Physics of Nanoscience: Traditional Approaches and New Aspects at the Ultimate Level deals with the description of properties at the Nano level and self-organizing quantum processes of Nano systems. The book presents the state of the art as well as theoretical discussions of future developments, beginning with simple Nano systems’ sensitivity to small variations in interaction potential compared to bulk cases, and continuing with a discussion of the structure and dynamics of Nano systems as a function of temperature. Additionally, the book analyzes self-organizing quantum processes—which are essential in the design of new Nano systems—in detail, and explores new aspects related to the quantum theoretical nature of time, leading to an expansion of the basic laws through nanotechnology. Finally, the book explores the effect of nanotechnological manipulations of brain functions and the need for the development of reliable models for the matter-mind complex. This innovative approach to understanding Nano systems makes Basic Physics of Nanoscience a vital resource for advanced students and researchers of physics, materials science, and neuroscience. 3.10 What is a particle? Dr. Wolfram Schommers is a professor of theoretical physics, professor of physics and materials sciences, and a distinguished professor of physics in Europe, China, and the United States. Professor Schommers’ scientific activities are concentrated on computational and theoretical physics. His main research interests are nanophysics (nanoclusters, nanostructures and nanomachines, temperature effects, and electronic states) and foundations of physics. In addition to his numerous publications, Dr. Schommers has served as editor of multiple journals. He is also an invited member of the Humboldt Academy, Academic Board of the Humboldt Society, and Advisory Board of Medical Ethics of the 21th Century.